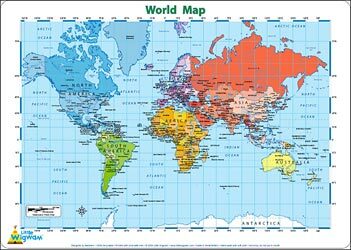 The Mercator projection map shows the continents in different bright colours, all countries and seas and oceans are named, as well as most capitals, major rivers and lakes. Lines of longitude and latitude at 15 degree intervals, tropics and equator lines are marked. Scaled at 1:100,000,000 approximately. This product has been designed by teachers and printed with child-safe ink. It is made of light but strong plastic (polypropylene) and 100% recyclable. Add some colour and to the kids’ room or the dining table.